A typical Mexican resort in 10 words or less: colossal palacio jam-packed with couples attempting to resurrect some romance. 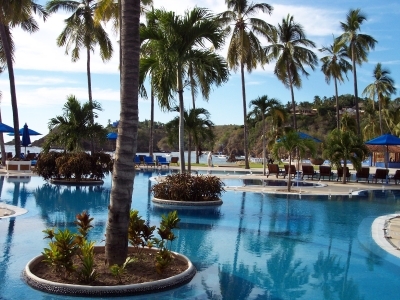 But, El Careyes and El Tamarindo, two plush escapes near the Pacific port city of Manzanillo, shirk the cliché completely. Think Jet Set getaway for the New Age guest. The Costa Careyes area, first developed in the late 1960s by Italian financier Giancarlo Brignone, is reminiscent of Acapulco in its 1950s heyday: a slice of secluded, yet, captivating sand, surf and glamour – read: a following that flies in from L.A.
Sarah Michelle Gellar and Freddie Prinze Jr. took over El Careyes for their wedding festivities, while Quentin Tarantino filmed part of Kill Bill II there. Celebrities who have taken a $10,000-per-week villa include Giorgio Armani, Stevie Wonder and Francis Ford Coppola. But even if you choose a more modest casita within these two Starwood Luxury Collection properties, you’ll detect German, Italian and Portuguese inflections in overhead conversations. You might run into the Mexican Ambassador to France while having a beachside dinner of the area’s finest seafood specialties. Or meet aBuenos Aires tycoon armed with his flawless soap-opera star girlfriend. That’s after a day of sunning at the palm tree-lined infinity pools, playing tennis with the resident pro, snorkeling and horseback riding on the beach at sunset. Paradise? Uh-huh. 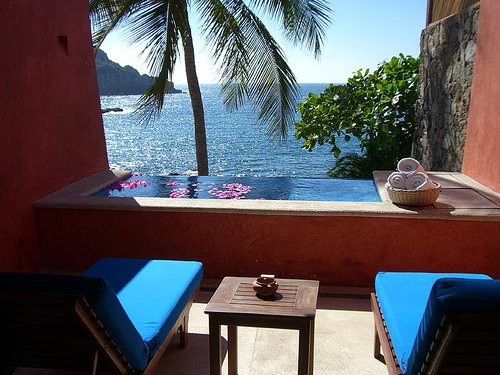 At El Careyes it’s easy to feel like royalty when your suite is built around an indoor Jacuzzi ripe with floating gardenias, flanked by built-in couches and all with breathtaking ocean views. The restaurant has an array of indigenous native dishes like fresh Dorado fish from Tenacatita bay accompanied by a Poblano pepper stuffed with squash blossoms and served with tomato and cream sauce to whet the appetite of even the most tedious eater. Of course, no meal is complete without a signature Tamarindo margarita or a selection of Mexican wines, or sample from the resort's collection of more than 30 tequilas. The spa treatments are some of the best ever created: a a range of natural Mexican remedies used with the most advanced European beauty products. Recommended: the clay wrap, the sodium free seaweed bath and the reflexology massage. A few hours of these and you’ll feel brand new again. And on the horizon, a haven for the international polo set. El Careyes’ polo fields are now being built to competition level. Up the road, at El Tamarindo, known for its stunning golf course, you’ll also find five-star accommodations on this nearby peninsula. First-time visitors to El Tamarindo think they’ve tripped into a Fantasy Island episode. Part of the Mexican jungle, Tamarindo resonates the distinct feel that you’re on a remote atoll. With only 30 villas, expect to be dazzled. Each one has its own outdoor living room and private plunge pool with Jacuzzi. The unobstructed view of the ocean waves entices the guest to stroll the beach just fifty feet away, too. Besides the water activities like kayaking, snorkeling, windsurfing and waterskiing, you can also pursue the Temescal, a ritualistic sweat structure officiated by a shaman, sure to clear your mind, body and soul. Whatever respite you are seeking, it’s only a short plane ride to paradise. Single or not, pack your sexiest beachcomber clothes because just about anyone who likes a taste of the movie star perk-filled good life will feel like they’ve found it in Careyes. Within the first five minutes.